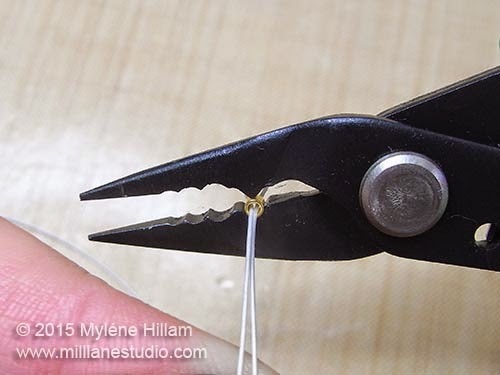 I've been teaching jewellery-making techniques for many years now and one of the things students find most difficult to accomplish is well-formed, secure crimps. 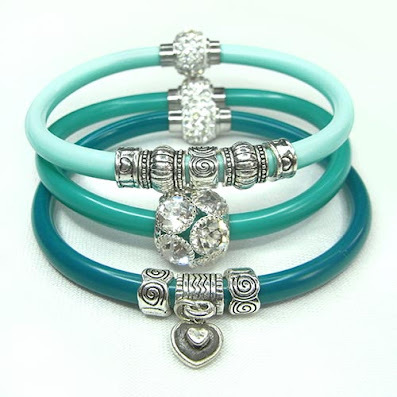 The crimping technique takes practice to perfect but once you've got the knack, your jewellery will be strong and will be able to withstand the tug test. 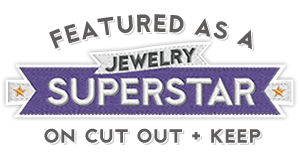 Whilst at CHA in January, I came across Xuron who manufacturer jewellery-making tools and they were were kind enough to give me a pair of their crimping pliers to test out. 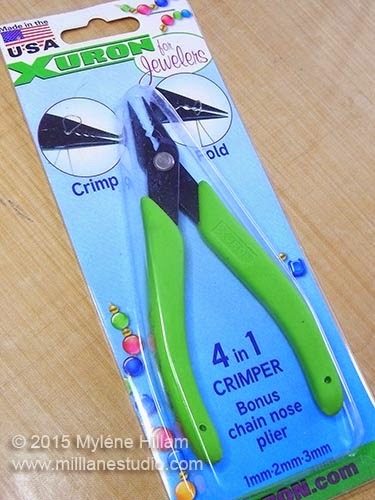 Now this is not just an ordinary crimping tool: Xuron 4 In 1 Crimper Tool crimps 1mm, 2mm and 3mm crimp tubes and in addition, it is also has a chain nose tip to get into very tight spaces. So let's test it out and see how well it performs. The first thing you'll notice is that the crimping station (the notch closest to the handle) is shaped like a "V". This "V" is the feature that sets the 4 in 1 Crimper Tool apart from standard crimping pliers. 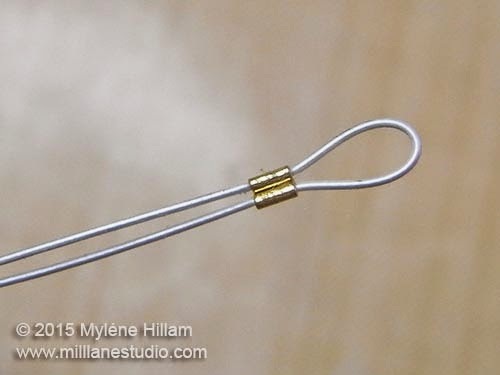 To use the tool, string a crimp tube onto a length of beading wire and then thread the end back through the tube, forming a loop. 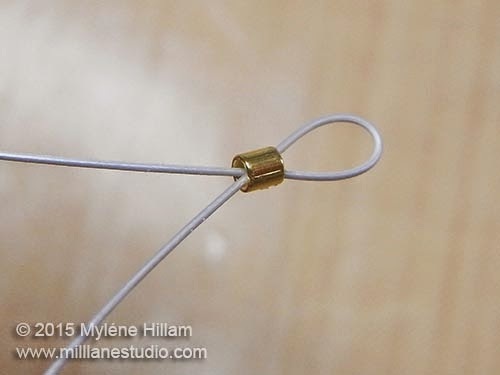 You can see in the photo below that the beading wire wants to cross over itself inside the tube. This is a definite "No-No"! 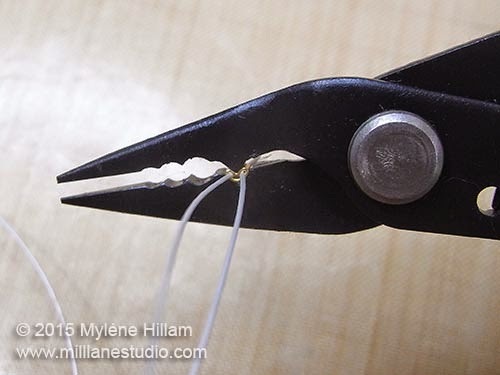 Separate those wires out so that they sit flat alongside each other. and squeeze the handles firmly to press the notch into the centre of the tube. 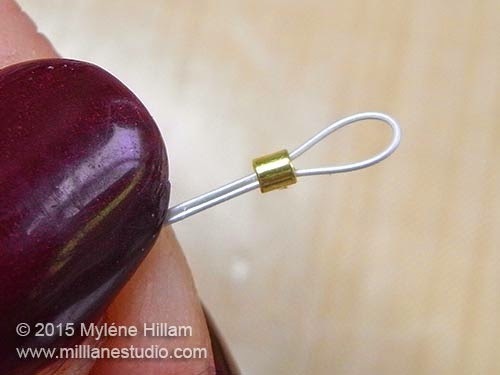 Make sure that one wire sits on either side of the channel as you form it. It should look like this, with one wire in each channel. Remove the crimp tube from the crimping station, hold the crimp tube and give each of the wires a tug to make sure your crimp is secure. 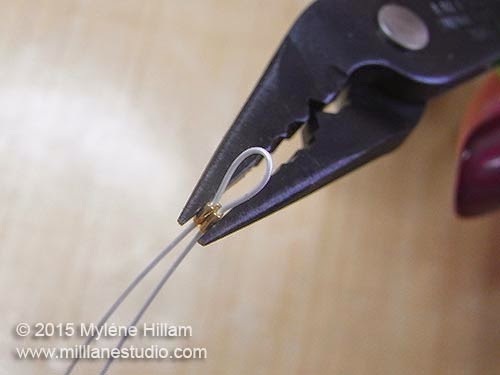 If not, check that you're using the right size crimp tube for the diameter of the beading wire you've chosen. Place the tube into the folding station corresponding to the size of your crimp tube - I used a 2mm crimp tube so I'm using the second notch from the top. Position it so that the bottom of the "V" is closest to the handles and squeeze to fold the wings of the crimp in. 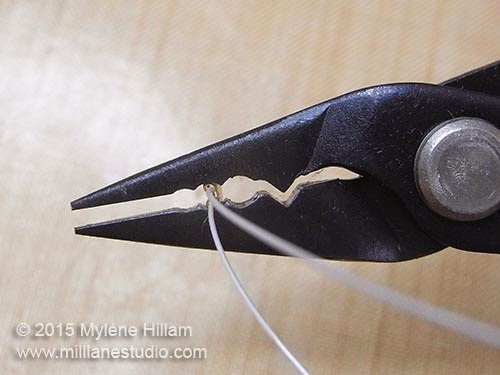 If you wish, you can flatten the crimp further for extra security by placing it into the chain nose tip of the crimper and squeeze a little more, but this step is optional! I really like this tool! 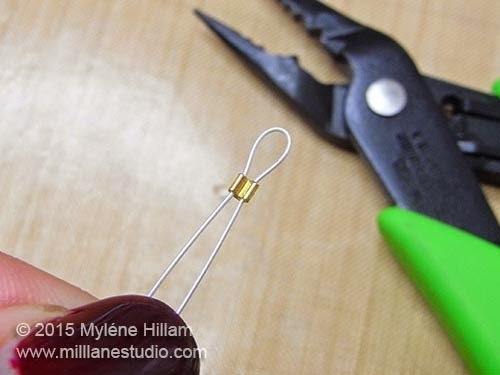 It will make crimping a lot easier for beginners and more experienced jewellery-makers alike. Because the notching station produces a pronounced "V", the crimp tube doesn't roll around when placed in the folding station as is prone to happen in standard crimping tools, so it is easy to create a perfectly formed, even crimp. 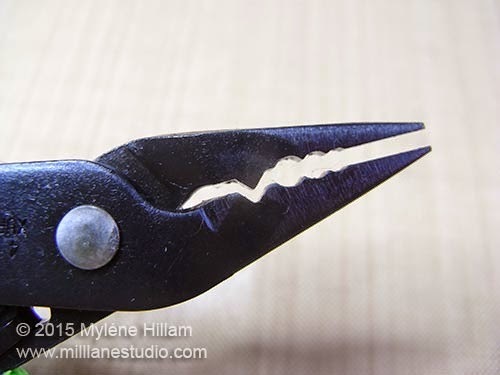 I mentioned that this tool also has a chain nose plier tip. Being such a fine tip, it's ideal for getting into tight spaces, adding to the tool's versatility. The bonus is that it also reduces the number of tools you need to have on hand to complete a project. My verdict? I give the Xuron 4 In 1 Crimper Tool the thumbs up!